Generations of Maxwell alumni cite the Oath of the Athenian City-State as a source of inspiration for a life of public service. So, too, does Michael Nutter, former mayor of Philadelphia and one of the most respected and celebrated large-city mayors in recent American history. Nutter will speak Friday, Oct. 14, at 4 p.m. in Maxwell Auditorium on “The Athenian Oath and Leadership in America.” In this talk, Nutter will describe how the Oath has guided him through his sometimes challenging roles in public affairs. 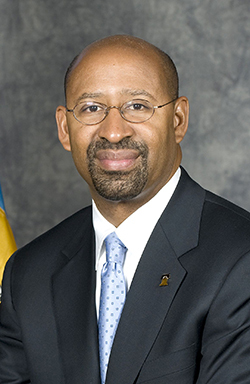 Nutter’s eight years as mayor of Philadelphia concluded in January. During his two terms, Nutter reduced murder rates to their lowest point since the 1960s, grew the city’s population for the first time in 57 years and guided the city through the worst economic challenges in recent history. He is now a professor of urban policy at Columbia’s School of International and Public Affairs. His talk will be given as part of the Tanner Lecture Series on Ethics, Citizenship, and Public Responsibility, endowed by W. Lynn Tanner ’75 PhD (PAIA), founder, CEO, and chairman of TEC Canada. This event is free and open to the public. Please RSVP at www.maxwell.syr.edu/tanner, where you also will find a live stream of this event.